We tip our hats in respect as the timeless grand tourer rolls out of the factory for the last time. The Aston Martin DB9 has arrived at the end of its production run, 13 years after it made its debut at the 2003 Frankfurt Motor Show. Through its life, the DB9 has seen Aston Martin go through the Ford ownership era and the car has gone on to become the base for models like the Vanquish, DBS and Rapide. 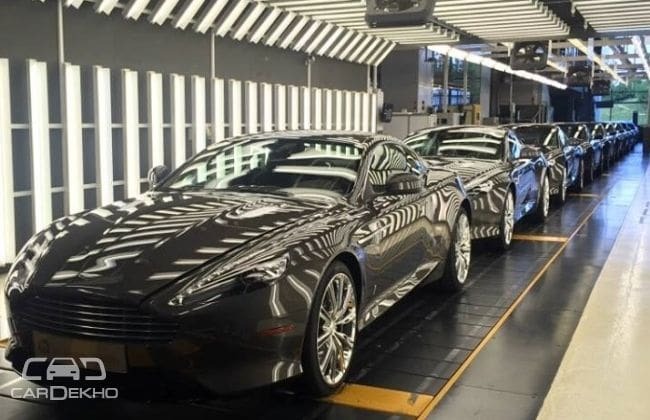 The DB9 was the first car to be built at Aston Martin’s Gaydon plant and it was also the first car to ever use the bonded and riveted ‘VH’ aluminium platform that went on to underpin the DBS, Vantage, Virage, Rapide and Vanquish. To power the car, the British automaker used a reworked version of the DB7’s engine. Trivia: Chronologically, the DB8 would follow the DB7, but Aston Martin chose the name DB9 to avoid the perception that the new car was powered by a V8 engine. The outgoing generation of the DB9 is powered by a 6.0-litre, naturally-aspirated V12 engine that produces 517PS of power at 6,500rpm and 620Nm of torque at 5,500rpm. While the output figures are tantalizing, the DB9 has shown its age, with hot hatches like the Ford Focus RS nearly matching its 0-100kmph time of 4.6 seconds. The DB9 had a lot of ‘firsts’ from Aston Martin and its successor, the DB11, is no different. The Geneva Motor Show debutant and 9th generation ‘DB’ model will be the first turbocharged Aston Martin ever as it employs an all-new, front-mid mounted 5.2-litre V12 that produces 608PS of power at 6,500rpm and 700Nm of torque at 1,500rpm. This makes it the most powerful DB model ever produced, with a claimed 0-100kmph time of 3.9 seconds and a top speed of 322kmph. As any other manufacturer does, Aston Martin has to move with the times and replace ageing products to make way for more advanced alternatives. However, the DB9 will go down in history as one of the all-time classics and if you are a deep-pocketed collector, it may be wise to pick one up. We’ll settle for a scale model!